Oxidation-Reduction titration (redox) is one of the main kinds of volumetric analytical methods. This is based on oxidation-reduction reaction in which electrons are transferred from one substance to the other. It assists in finding out the component of numerous substances qualitatively. Oxidation-Reduction reaction is the reaction that comprises the movement of electrons from one point to another, in a reaction between analyte and titrant. The general principle of Redox reaction lies in the fact that reaction takes place between the reducing and an oxidizing agent. 1) Oxidation: It is simply stated as loss of electrode to give higher oxidation state. The electrode is for all time more positive. 2) Reduction: It is gain of electron to give lower oxidation state. The reduction electrode is for all time more negative (more negative). 3) Oxidizing agent is the substance (s) which tends to take up an electron(s) and get reduced to the lower oxidation state. 4) Reducing agent is the substance(s) which tend to give up electron(s) and get oxidized to the higher oxidation state. The tendency to oxidize or reduce based on the reduction potential of a substance. The course of monitoring redox titration via potentiometer requires the need to review and comprehend very well the basic of electrochemical cells and electrode potential. This is a device in which the electrolysis of solution occurs. It is a compartment where electrochemical reaction takes place. There are fundamentally two kinds of cells. 1) Galvanic cell: This is the kind of electrochemical cell in which the chemical reaction spontaneously takes place to generate electrical energy. 2) Electrolytic cell: This is the kind of chemical cell in which the electrical energy under the influence of an external source of power generates chemical energy. A typical cell is made up of electrodes, electrolyte and salt bridge. (a) Anode, where oxidation occurs and (b) Cathode where reduction occurs. - Electrolyte: It is a liquid or molten substance (or solution) which can allow passage of the electrical current. They are conducting in nature. - Salt bridge: This is frequently made up of KCl crystals. They connect two reacting systems (beaker) altogether, therefore allowing the movement of electron from one beaker to other thus preventing the overconcentration of electron in beaker. Though, it disallows any other substance from passing. Nearnst Equation: This is the equation which relates the standard potential of the system by the concentration of both oxidized and reduced form whenever they are deduced in unit activity. Each and every electrode consists of the tendency to gain or lose electron whenever in reaction, the tendency of each and every electrode is termed to as the electrode potential. The electrode potential is more frequently the function of its makeup which consists of huge impact on the cell reaction. Thus, Ce+4 is a strong oxidizing agent whereas Ce3+ is a very weak reducing agent. The more positive the electrode potential, the stronger the oxidizing power of the oxidized form is and the weaker the reducing power of the reducing form is. B) The more negative the reduction potential, the weaker the oxidizing power of the oxidized form is and the stronger the reducing power of the reduced forms is. Illustration: Zn2+ + 2e- → Zn, Eo = - 0.76 is very negative. Therefore, Zn2+ is a weak oxidizing agent whereas Zn is the strong reducing agent. The course of redox titration is examined potentiometrically. Potentiometer measures in voltage, that is, the concentration of species in solution. Though, it will be noted that at each and every electrode, the given half reaction take place. Ce4+ + e- ↔ Ce3+ Eo = + 1.61V. Thus, the cell reaction can be in other ways. 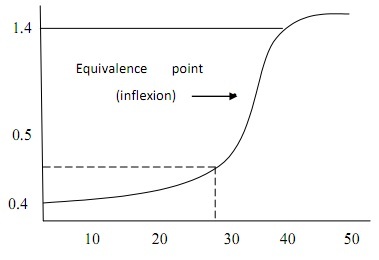 The titration curve is categorized into three phases (or stages). Each aliquot of Ce4+ added is consumed and form equal mole of Ce3+ as Fe3+. Before the equivalence point excess Fe2+ remain in the solution, thus, computing the E of the cell is ensure via the activity of Fe2+. Adequate Ce4+ has been added to react by all Fe2+. E = 1.23 - 0.241 = 0.99V. Nearly all the Fe2+ are now in form of Fe3+ while the surplus Ce4+ remained in the system. Therefore the E of cell is made from the activity of Ce4+. The end point of the redox titration can be found out by the use of electrode to measure the potential and is plotted against the volume of titrant. Three visual indicators are generally employed. This is whenever the titrant is highly colored .The colour change might be employed to detect the end point. Illustration: Titration of acidified KMnO4 against freshly prepared FeSO4 solution. KMnO4 which is deep blue or pink transforms to colourless at end point. Starch indicator is frequently used whenever the titration comprises iodine or starch complex, which is blue colour however at the end point turns colour less however addition of drops of starch turns it back to blue. These are highly colored dyes. They are weak reducing or oxidizing agent. They are potential dependent. Illustration is Ferroin whose colour changes from pale blue to red and is potential dependent. Both are analytical methods which comprises the use of iodine [I-] however of different status. 1) Iodine is a fairly strong oxidizing agent and can be employed to titrate the reducing agent. Titration by I2 as oxidizing agent is termed as Iodimetric analysis. This is performed in neutral or mildly alkaline (pH = 8) medium. 2) Iodine is as well a weak reducing agent and will decrease oxidizing agent so whenever excess iodine is added to a solution of an oxidizing agent, I2 is generated in an amount equivalent to the oxidizing agent present. This analytical method is termed as iodometric method.